In international relations, a balance of power exists when there is parity or stability between competing forces. As a term in international law for a 'just equilibrium' between the members of the family of nations, it expresses the doctrine intended to prevent any one nation from becoming sufficiently strong so as to enable it to enforce its will upon the rest. "BoP" is a central concept in neorealist theory. Within a balance of power system, a state may choose to engage in either balancing or bandwagoning behavior. In a time of war, the decision to balance or to bandwagon may well determine the survival of the state. The basic principle involved in a balancing of political power, as Charles Davenant pointed out in his Essay on the Balance of Power, is as old as history, and was familiar to the ancients both as political theorists and as practical statesmen. In its essence it is no more than a precept of commonsense, born of experience and the instinct of self-preservation. As Professor L. Oppenheim (Internal. Law, i. 73) points out, an equilibrium between the various powers which form the family of nations is, in fact, essential to the very existence of any international law. In the absence of any central authority, the only sanction behind the code of rules established by custom or defined in treaties, known as 'international law', is the capacity of the powers to hold each other in check. If this system fails, nothing prevents any state sufficiently powerful from ignoring the law and acting solely according to its convenience and its interests. Preserving the balance of power as a conscious goal of foreign policy, though certainly known in the ancient world, resurfaced in post-medieval Europe among the Italian city states in the 15th century. Francesco Sforza, Duke of Milan , was the first ruler to actively pursue such a policy, though historians have generally (and incorrectly) attributed the innovation to the Medici rulers of Florence whose praises were sung by the well-known Florentine writers Niccolò Machiavelli and Francesco Guicciardini. Universalism, which was the dominant direction of European international relations prior to the Peace of Westphalia, gave way to the doctrine of the balance of power. The term gained significance after the Treaty of Utrecht in 1713, where it was specifically mentioned. It was not until the beginning of the 17th century, when the science of international law assumed the discipline of structure, in the hands of Grotius and his successors, that the theory of the balance of power was formulated as a fundamental principle of diplomacy. In accordance with this new discipline, the European states formed a sort of federal community, the fundamental condition of which was the preservation of a 'balance of power, i.e. such a disposition of things that no one state, or potentate, should be able absolutely to predominate and prescribe laws to the rest. And, since all were equally interested in this settlement, it was held to be the interest, the right, and the duty of every power to interfere, even by force of arms, when any of the conditions of this settlement were infringed upon, or assailed by, any other member of the community. This 'balance of power' principle, once formulated, became an axiom of political science. Fénelon, in his Instructions, impressed the axiom upon the young Louis, duc de Bourgogne. Frederick the Great, in his Anti-Machiavel, proclaimed the 'balance of power' principle to the world. In 1806, Friedrich von Gentz re-stated it with admirable clarity, in Fragments on the Balance of Power. The principle formed the basis of the coalitions against Louis XIV and Napoleon, and the occasion, or the excuse, for most of the wars which Europe experienced between the Peace of Westphalia (1648) and the Congress of Vienna (1814), especially from the British vantage point (including, in part, World War I). 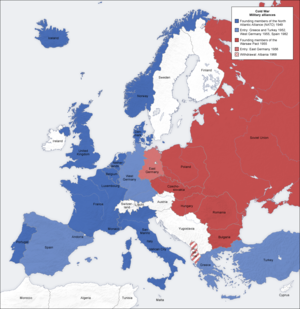 During the greater part of the 19th century, the series of national upheavals which remodelled the map of Europe obscured the balance of power. Yet, it underlay all the efforts of diplomacy to stay, or to direct, the elemental forces let loose by the French Revolution. In the revolution's aftermath, with the restoration of comparative calm, the principle once more emerged as the operative motive for the various political alliances, of which the ostensible object was the preservation of peace. The continental policy of England [after 1525] was fixed. It was to be pacific, mediating, favourable to a balance which should prevent any power from having a hegemony on the continent or controlling the Channel coasts. The naval security of England and the balance of power in Europe were the two great political principles which appeared in the reign of Henry VIII and which, pursued unwaveringly, were to create the greatness of England. In 1579 the first English translation of Guicciardini's Storia d'Italia or History of Italy popularised Italian balance of power theory in England. This translation was dedicated to Elizabeth I of England and claimed that "God has put into your hand the balance of power and justice, to poise and counterpoise at your will the actions and counsels of all the Christian kings of your time". Sir Esme Howard wrote that England adopted the balance of power as "a corner-stone of English policy, unconsciously during the sixteenth, subconsciously during the seventeenth, and consciously during the eighteenth, nineteenth and twentieth centuries, because for England it represented the only plan of preserving her own independence, political and economic". Nio, Ordeshook, and Rose. The Balance of Power, 1989. Cambridge: Cambridge University Press. J. Pirenne, The Tides of History: From the Expansion of Islam to the Treaties of Westphalia: Volume II (London: 1963), p. 429. Michael Sheehan, The Balance of Power: History & Theory (Routledge, 2000), p. 35. Sir Esme Howard, 'British Policy and the Balance of Power', The American Political Science Review, Vol. 19, No. 2. (May, 1925), p. 261. Waltz, K. N. (1979). Theory of International Politics. New York: Random House. Waltz described IR in a systemic way, consisting of an anarchic structure and interacting units. His BOP-theory says that (smaller, weaker) states will balance the power or preponderance of more powerful ones to ensure that the latter do not become too powerful and dominate all other. For Waltz, a bipolar structure, as given in the Cold War, seems to be the best, i.e. the most peaceful one. Most relevant for his theory are chapters 1, 4-6. Ernst B. Haas, "The balance of power: prescription, concept, or propaganda", World Politics, Vol. 5, No. 4, (1953), pp. 442-477. Paul W. Schroeder, "The Nineteenth century system: balance of power or political equilibrium? ", Review of International Studies, 15, (1989), pp. 135-153.